Its hard to see your pet suffering from skin irritation and itching – they’re uncomfortable, unhappy, and their coat and skin suffers from constant scratching. Royal Canin understands that many medium-breed dogs can be prone to skin allergies, and knows the right diet can go a long way toward returning your dog’s skin and coat to top condition. Royal Canin Medium Dermacomfort is a reduced-allergen formula, with super-high-quality proteins and a unique cocktail of nutrients to help support the skin. 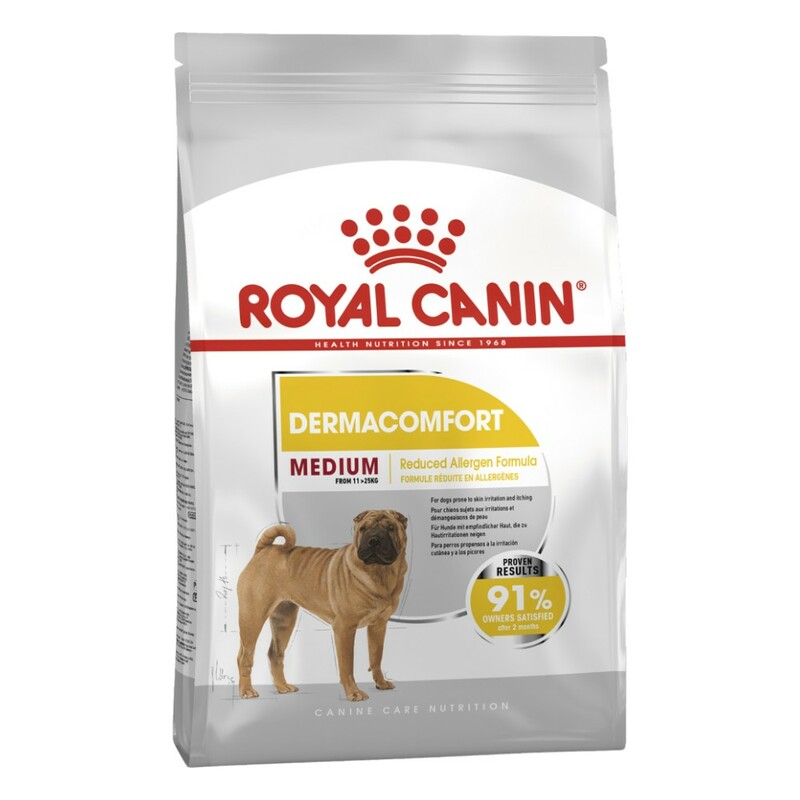 With Royal Canin Medium Dermacomfort, you can rest assured that you’re doing everything you can to help your dog overcome his skin irritation through diet. omega 3 and 6 fatty acids. Rice, wheat gluten*, wheat, animal fats, maize gluten, husked oats, maize, minerals, hydrolysed poultry liver, soya oil, beet pulp, fish oil (source of EPA and DHA), flax seeds (source of omega 3), fructo-oligo-saccharides, borage oil (source of gamma-linolenic acid), marigold extract (source of lutein). ADDITIVES (per kg) : Nutritional additives: Vitamin A: 30000 IU, Vitamin D3: 800 IU, E1 (Iron): 43 mg, E2 (Iodine): 4.3 mg, E4 (Copper): 13 mg, E5 (Manganese): 56 mg, E6 (Zinc): 168 mg, E8 (Selenium): 0.09 mg - Technological additives: Clinoptilolite of sedimentary origin: 5 g - Preservatives - Antioxidants. ANALYTICAL CONSTITUENTS : Protein: 24% - Fat content: 17% - Crude ash: 5.9% - Crude fibres: 1.5% - Per kg: Omega 6 fatty acids: 35.1 g including gamma-linolenic acid: 0.3 g - Omega 3 fatty acids: 11.4 g including EPA/DHA: 4.1 g. * L.I.P. : protein selected for its very high digestibility.